Almost all scientists now agree that the earth’s climate is changing, primarily due to increasing concentrations of greenhouse gases caused by human activities such as the burning of fossil fuels and deforestation. The average temperature in Britain is increasing so fast that, in climate terms, gardens are moving south at the rate of 12 metres a day. With waterlogged winters and summer droughts, climate change is going to have a major impact on plant growth, and on the way we design, plant and maintain our gardens. Natural sustainable energy resource. Carved wooden totem poles interpret the artwork of the generation set to live ‘a lifetime ahead’, depicting their hopes for tomorrow’s world, and are of course made of wood produced from a sustainable source. Even though this garden is set for ‘a lifetime ahead’, all planting is suited already to our present climate, given appropriate planting conditions. 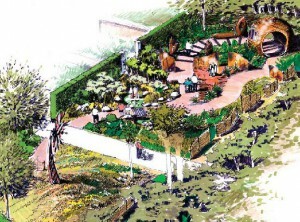 Kim Wilde attended Capel Manor Horticultural College, completing a City & Guilds Phase II Course in Planting & Planting Design the summer of 2002. Kim’s television appearances include Better Gardens, Garden Invaders, The Chelsea Flower Show and The Great Garden Guide. Kim is also a gardening journalist – contributing columns to publications such as The Guardian, Prima and Bella Magazine – and has designed show gardens with David Fountain, winning medals at both the RHS Tatton Hall Show and the BBC Gardeners World Exhibition. 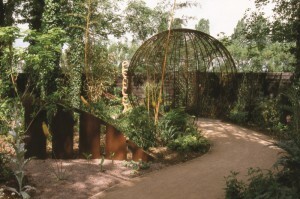 After graduating from Pershore College of Horticulture in Landscape & Amenity Management, Richard initially worked as a freelance designer and landscaper before being approached in 1999 by television production company Bazal and shortly afterwards joined popular daytime television programme Garden Invaders as a member of the research team. Richard worked on Garden Invaders for three series, before leaving to join Catalyst Television as Assistant Producer on the flagship BBC programme Gardeners’ World.